Morning Vibration. Why do you have it? Why does it go away? How do you minimize it? So you get up and after a nice hot cup of coffee you finish packing the motorhome. You have enjoyed the last couple of weeks at a real nice campground and were glad you had that nice concrete pad to park on but now it's time to hit the road. You say your goodbyes and then pull out. The interstate is only a couple miles down the road, so soon you are on that nice smooth ribbon of asphalt. Then it hits you. Just as it does almost every time you start out on a days drive you feel that vibration. What is wrong with the RV? You had the tire tread trued just a month ago and an alignment a month before that and you even had the tire tread trued the month before that, but you still get that d....m vibration almost every time you leave a campground. There must be something wrong with the new tires as you didn't have the vibration on the old worn out tires last year. 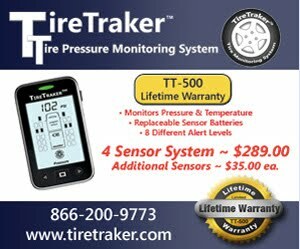 The biggest problem is that after driving for 30 minutes to an hour the vibration goes away so when you go the the RV center or tire shop you can't show the service manager the problem. Does this sound like you? Do you have a "ghost" vibration that is real bothersome but almost always bothers you in the mornings. It that what's troubling you bunky? Well I have news for you, there is a good chance what you are experiencing is tire "flatspotting". When rubber, Nylon or Polyester are warm and you place them under load or deform them as happens when you park and the portion of the tire in contact with the ground is flat not round, these materials take a "set" and when they cool down and the longer they are deformed the firmer that "set" becomes. Later when you start up it takes a combination of heat and flexing to work the "set" out of the tire. New tires with heavier tread rubber will need more exercising that a worn out tire. High Performance tires with Nylon cap ply will need more exercising than a tire with no Nylon in the tread area. Passenger or LT tires with Polyester body ply will need a bit more flexing that a steel body tire does. Other major contributors to the level of flatspotting the the length of time the vehicle is parked, the temperature of the tire when parked and the amount of deflection the tire takes when loaded. There really are very few things you can do to completely eliminate this flatspotting but I can provide some suggestions on how to decrease it. 1. Ensure you have at least the minimum inflation needed to carry the load. More deflection due to overload will generate more heat. More heat means the "set" will be more pronounced with the warmer materials. 2. Give your tires as much time as possible to cool off before parking. Coolers tires take less of a "set" than warn tires. Maybe move to your campsite but park a couple feet forward of your final spot then after a couple hours move back that last couple of feet. 3. Decrease the load on the tires. Get rid of the extra load of that bowling ball collection you are hauling around in the basement storage. Less load means less deflection which means less flatspoting. 4. If you are going to park for an extended time you can inflate your tires to the max inflation they are rated for. More inflation means less deflection....see #1 above. This is something I do when I am parking for the Winter. 5. Consider running 5 or 10 or maybe even 15% more inflation than the minimum needed to carry the load but do not exceed the tire or wheel max cold inflation. 6. Cover your tires with a White tire cover. This will help keep them from heating up while parked. 7. If you have an older coach and it is on it's 2nd or 3rd set of tires you should probably consider a new set of shocks. They will help control the vibration due to flatspotting.